We’d love your help. 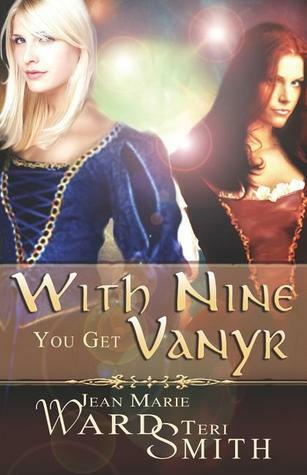 Let us know what’s wrong with this preview of With Nine You Get Vanyr by Jean Marie Ward. To ask other readers questions about With Nine You Get Vanyr, please sign up. Jean Marie Ward writes fiction, nonfiction and everything in between. Her first novel, With Nine You Get Vanyr (written with the late Teri Smith), finaled in two categories of the 2008 Indie Book Awards. Her short stories appear in numerous anthologies, including the award-winning Hellebore and Rue, The Modern Fae’s Guide to Surviving Humanity, and Tales from the Vatican Vaults. Her short story “L Jean Marie Ward writes fiction, nonfiction and everything in between. Her first novel, With Nine You Get Vanyr (written with the late Teri Smith), finaled in two categories of the 2008 Indie Book Awards. Her short stories appear in numerous anthologies, including the award-winning Hellebore and Rue, The Modern Fae’s Guide to Surviving Humanity, and Tales from the Vatican Vaults. Her short story “Lord Bai’s Discovery”, which appeared in the Eppie-nominated anthology Dragon’s Lure, was shortlisted for the Washington Science Fiction Association’s Small Press Award. She is also known for her art books, Illumina: The Art of J.P. Targete and Fantasy Art Templates. She edited the web magazine Crescent Blues for eight years and now writes for other online venues, including BuzzyMag.com. Ms. Ward has written for daily and weekly newspapers, and published government journals. She served as the public relations officer for the Defense Finance and Accounting Service for five years, and managed the development of some of the first Department of Defense web sites. Her resume also includes a stint as an assistant producer for the local access cable program Mystery Readers Corner. A Washington DC native, Ms. Ward now lives in Virginia with her cartoonist husband Greg Uchrin (creator of Intravenous Caffeine), a very gracious cat and hordes of ninja squirrels.